The double fisherman’s knot, also known as the grapevine knot uses two double overhand knots in their strangle knot form, one tied around the standing part of the other. This makes it stronger than the fisherman’s knot. Though mainly used as a bend to join two ropes it can also be tied with the ends of a single rope to make a loop with it. Examples are the Bachmann knot and the Prusik loop utilized in tying the Prusik knot. It is used in creating a cordelette to assist rock climbers. Overlap the ends of the 2 lines parallely before starting with making the knot. The back view of the knot shows a symmetrical structure. 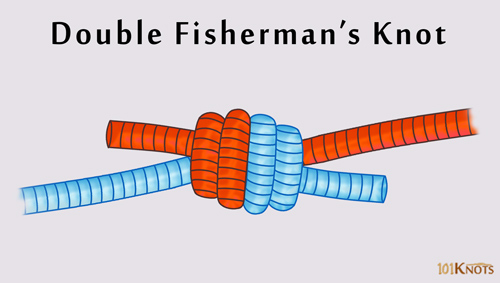 The triple fisherman’s knot is recommended for high modulus ropes used for load bearing. Some tests with specific ropes have shown that it has a breaking strength of around 5,820 pounds and depletes around 46.1% of the rope’s original strength (54 % efficiency). Sliding double fisherman’s knot – Used by arborists to provide an adjustable sling. 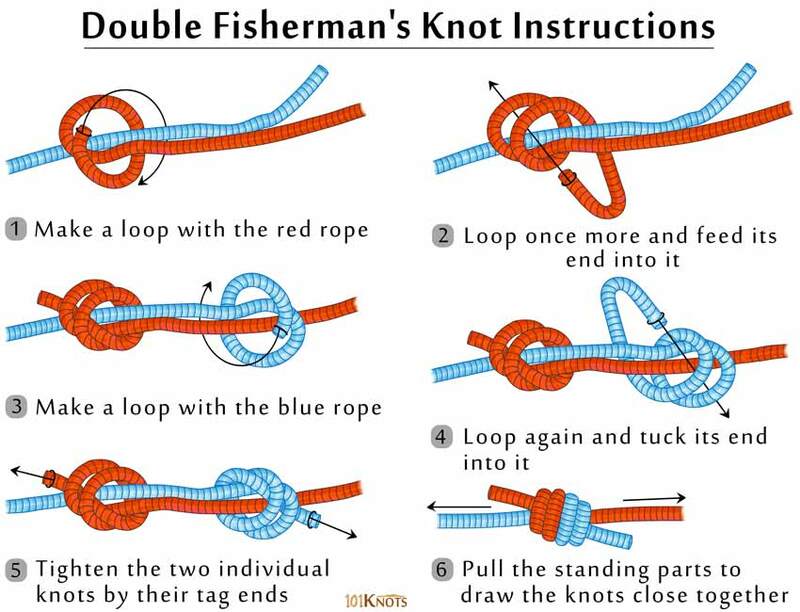 Nice pictures explaining the double fishermen’s knot. Pitifully number 3 is incorrect. The blue rope at the right, starting it’s first loop, should cross the red rope in front of it. Thanks for pointing this out. We have made the necessary changes.